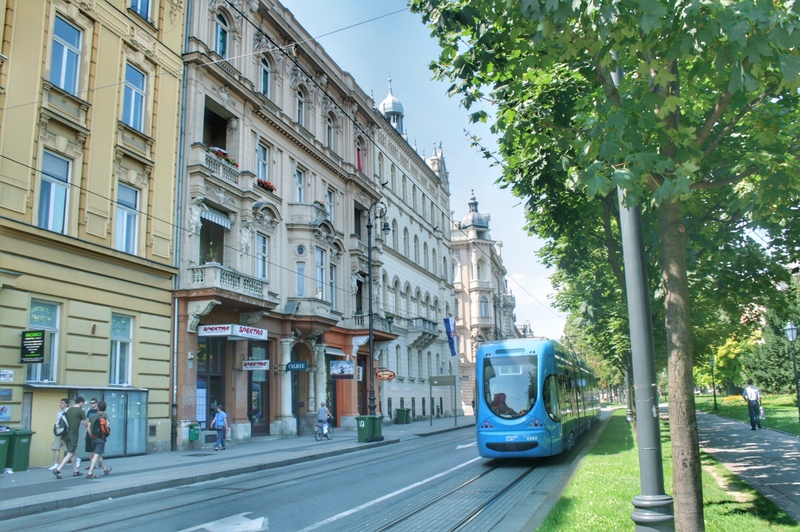 Here’s the assorted Zagreb public transport options – including information on how to travel from Zagreb Airport to the city centre. If you arrive by plane, Zagreb Franjo Tudjman Airport (newly opened in April 2017) is about 15km from the heart of Zagreb. The best option is the inexpensive Croatia Airlines bus which takes you to the main bus station in central Zagreb. Buses leave every half an hour outside the airport terminal. Tickets, costing 30 Kunas (£3.50/€4/$5), can be bought from the bus driver. More details on this bus at www.plesoprijevoz.hr. Journey time is 35-40 minutes. You can take also a taxi from the airport to the city centre for about 200 Kunas or so (about £22/€27/$34). Taxis wait outside the terminal building. Trams are undeniably the best way to get around Zagreb – a (reduced) service even runs at night. There are 15 routes in Zagreb, and many stop either at Trg bana Jelacica (the main square) or at the main train station. Full details of the tram system can be found at the Zagreb Tram website – here’s the tram map (daytime services). Almost all visitors are puzzled as to how to obtain tickets for trams as they are not sold on-board! Walk to the first newspaper kiosk and ask for a “tramvajska karta” (tram ticket) which are sold singly or in packs of ten. Once you board the tram, you must remember to validate your card in the machines. Zagreb’s public transport system includes two tourist bus routes that operate a hop-on/hop-off service. The red route operates in the heart of the city, whilst the green route operates on a much longer route, taking in places such as Maksimir and Lake Bundek. Both routes operate several times a day, although these (open-air) buses only run from May to October. Tickets cost 70 Kunas (approximately £8/€9/$12) for adults or 35 Kunas (£4/€4.50/$6) for children 7 and over for a full day; tickets can be purchased from the driver. “A tourist train – how does that work? !” you might think. Well, okay, it’s not really a train but a vehicle designed to resemble a train. It runs on a small route in the centre of the city, starting and ending on Ban Jelacic Square. It runs every day at half past the hour from 9.30am to 7.30pm; tickets cost 10 Kunas for adults and 5 Kuna for children. This isn’t really a way of ‘getting around’ Zagreb as it only runs on a 66m track from the Lower Town to the Upper Town. However, we’ve included it here firstly as a reminder (to visit it!) and secondly because the funicular railway is in fact the oldest Zagreb public transport component! Visit it for a ride (by Ilica in the Lower Town, or near the Lotrscak Tower in the Upper Town). Hot on the heels of many a European city, Zagreb also has a small cycle hire scheme in operation. It is perhaps not quite as straightforward to use as some others, as you need to pre-register online and then activate your account with some funds (which can be used against future bike rentals). After you’ve done all of that, the first 30 minutes of bike rental is free, after which it’s 8 Kunas an hour. Find out more at www.nextbike.hr/en/zagreb/. Uber is available in Zagreb (and other Croatian cities). Just open up your app and get an Uber taxi! Google Maps now shows transport (or ‘transit’) options on its maps when you look up directions for routes in Zagreb – including trams and buses. A useful tip in finding out how to get around the city!